Buy Australia and New Zealand lottery tickets online. The most popular and most played lotto games from Australia and New Zealand are now available online for players from around the World. Please visit our special page about this Australian lottery : AUSTRALIA OZ LOTTO. Thank you. Buy lotto tickets and get all detailed informations about most played and biggest lotteries and lotto from Europe. Please visit LOTTERIES OF EUROPE Enjoy ! Good luck ! most played and biggest lotteries and lotto from North and South America. Play them now ! Please visit LOTTERIES OF AMERICA Enjoy ! Good luck ! Please visit LOTTERIES OF ASIA Good luck and enjoy ! You may play all the listed above lotto from Australia and New Zealand online. Amazing ! All you need is Internet connection and you may start playing any most played lottery or lotto, from any place in the World. Learn, why it's wise to play lottery and LOTTO ONLINE. We have got players from cold Alaska state, playing GERMANY LOTTO. As well, a woman from South Africa regulary plays FRANCE LOTTO online, just because her mother was born there. Some hot-headed lotto fans, play lotto in another part of the World just, because there is a very high jackpot cumulation, in that local lotto. There is always a "huge" jackpot to win, somewhere in the World. Some players check regulary for huge jackpots. You may now play all the lotteries online, more than 35 lotteires from around the world. So you may always find a jackpots of your dreams. Find out all lotto available to play online at our page LOTTERIES OF THE WORLD. On the right side, you will find the actual biggest jackpot available to play, from all biggest lotteries, from around the world. All you need to do is click Buy Ticket NOW !, register and play. Good luck ! Lottery and lotto in Australia has been around there for quite some time now with different Australian states, all introducing different lotteries at different times. It happened very often that one state introduced one specific lotto and other states followed with the same suit. The very first Australian lottery was commenced in Sydney in the 1880’s and were run as privately operated sweepstakes lottery. In the meantime, we would like to show you modern Australian Scratch card Aussie Christmas, as shown on the left picture. Then prohibition forced suddenly such lottery sweepstakes to move their operating base to Queensland followed by Tasmania and then into Victoria state. Virtually these lotteries continue to exist to present times and it seems to be just as successful as they ever have been before. Other lottery and lotto games in Australia have been operated by the government with one known as the Golden Casket Art Union. This lottery was introduced in 1916 year with proceeds going mainly to local community development and other wide charitable purposes. This lottery was very successful among Australian society and formed the base model for other state run lottery games that were designed in the coming years. On the right picture: modern times and modern look of Australian Powerball lottery draw studio.Powerball lotto is drawn on a every Thursday and with a set off jackpot of at least Aus $2 Million, frequently rolls over. 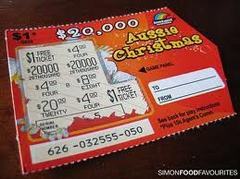 Other types of Australian lottery include also privately owned soccer pools which were loosely based on the English version of the lottery game and such games were introduced in the 1970’s. In 1981 prize pools from the Victorian, Tasmanian, the ACT, Northern Territory, South Australian and Western Australian lotteries were combined and Queensland state continued to run it’s own lottery. An agreement was made in 1993 with NSW lotto which resulted in the creation of a national lottery network. 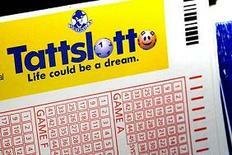 Tattslotto is a part of Tattersall - Australia's biggest lottery operator. Tattersall, in its home state of Victoria, is sticking to the higher-priced Saturday Lotto, Oz Lotto and Australia Powerball Lotto. The company controls most of the nation's lotteries - with a presence in Victoria, Tasmania, the ACT and the Northern Territory. TATTS LOTTO - another big Australian lotto. Drawn on a every Saturday, the game is easily played by selecting 8 numbers from a range of numbers 1-45 of which the first 6 numbers are classified as “winning numbers” and the final two numbers classified as “supplementary numbers”. The jackpot is won by matching the six “winning numbers”. There are five divisions of prize wins and the odds of winning the jackpot equates approximately to just over 8 million to 1. The set off jackpot guarantees a Aus $4 Million prize. At the moment, there is no possiblity to play Tattslotto online, using our partner's services. Go back to the top of this page to play other Australian lotto games online, please.